Be the first to share your favorite memory, photo or story of Arden . This memorial page is dedicated for family, friends and future generations to celebrate the life of their loved one. 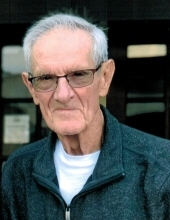 Arden G. Fellbaum, 84, of Athens, passed away on Tuesday, January 29, 2019 at Aspirus Wausau Hospital. He was born July 22, 1934 in the Town of Stettin to the late Edwin and Leona (Mueller) Fellbaum, he was one of 12 children. On February 19, 1955 Arden married Arlene Hahn in Pine City, Minnesota.Arden is survived by his wife of 63 years Arlene, children Randall Fellbaum (Kathy Genovese) of Merrill, Brenda Fellbaum of Athens and Susan Fellbaum of Inver Grove Heights, Minnesota and grandchildren Travis Leitzke, Lauren Hunsanger and Tyler Johnson. Sisters Ramona Ulrich, Arlyle (Carl) Schmidt, Darlene Osness, Ardell Salzwedel, Lorna (Joe) Grabko, Sharon Schultz and many nieces and nephews. He was preceded in death by his parents, a daughter, Debra Fellbaum, and siblings Marcella Beckman, Vernon Fellbaum, Donald Fellbaum, Dennis Fellbaum and Beverly Fellbaum.Arden worked for 30 years at Marathon Electric. He also farmed until 1976. Later on, he raised ginseng and built custom ginseng equipment in his machine shop. Arden served in the Army Reserves and was a drill sergeant. In April of 2017, he had the privilege of taking the Honor Flight to Washington D.C, with his grandson Travis serving as his guardian. Arden enjoyed hunting, fishing, gardening, watching Brewer baseball, casino trips, music festivals and making venison sausage. He was very handy and loved to fix things. He also loved his American Eskimo dogs Benji, Mickey and Buddy who have crossed over the rainbow bridge. The family would like to extend their sincere gratitude to the staff in the Palliative Care unit at Aspirus Hospital and Jody Wilkins, PAC for their kind and compassionate care. Funeral services will be on Saturday, February 9, 2019 at John J. Buettgen Funeral Home 900 Old Highway 51, Mosinee. Visitation will be from 9:00 - 11:00 with service to follow with Pastor Donald Love officiating. Burial will take place at a later date. In lieu of flowers memorials can be sent to the University of Minnesota Veterinary Medical Center for the loving care they provided to his beloved dog and best friend Buddy. Online condolences can be expressed at www.HonorOne.com. To send flowers or a remembrance gift to the family of Arden G. Fellbaum, please visit our Tribute Store. "Email Address" would like to share the life celebration of Arden G. Fellbaum. Click on the "link" to go to share a favorite memory or leave a condolence message for the family.